Everyday, traditional markets bustle with people looking for some fun and cheap shopping. Here, you can witness the lives of ordinary citizens and feel the history of Jeju Island. On top of that, you can purchase fresh, local, specialty products like medicinal herbs, flowers, and traditional ingredients at low prices. In Jeju, there are two types of markets: those that run every day, and those that run every five days. These are known as traditional five-day markets. Seeing as the many of villages have five-day markets, merchants can move about the island selling their goods from one to the next. Because they are constantly traversing the island, these merchants play an important role in delivering information from village to village. At traditional five-day markets, you can see chaotic scenes of adorable pets on sale like cats, rabbits, dogs, turtles, and ducks. In spring, colorful flowers are on display. While it still embodies the essence of your traditional haggle-friendly flea market, these markets are generally clean, convenient, and safe. If you get an opportunity, be sure to visit a Jeju traditional five-day or daily market. Products available: Agricultural, fisheries, livestock products, linen and cottons, imported goods, medicinal herbs, and crops. Dongmun Market is the largest permanent market in Jeju City and sells fresh agricultural, fisheries, and livestock products at low prices. As the center of commerce in Jeju City, this daily market was included as part of Olle Course No. 17. Directions: By bus, it is 20 minutes away from the Jeju International Airport and 10 minutes away from the Jeju sea port. Get off at the Dongmun Market bus stop or the Jungangno bus stop. Products available: Agricultural, fisheries, livestock products, linen and cottons, and imported goods. Seomun Market is located to the west of the Gwandeokjeong Pavilion in Jeju City. People who want to get a taste of the island’s traditional flea markets should visit here. You can enjoy Jeju’s celebrated fresh and juicy black pork and beef at low prices. There are dozens of butcher shops where you can choose your choice of meat and then have it brought to a nearby restaurant for a delicious barbecue with side dishes (10,000 won for four people, plus the cost of meat). Around the market there are various restaurants and furniture stores. Products available: Jeju silver hair tail fish, and mackerel (ingredients for raw fish dishes). As the center of sightseeing and commerce in Seogwipo City, the Seogwipo Maeil Olle Market has a long and storied history. The market recently renovated its arcade, and added shopping carts, surveillance cameras, rubberized walking surfaces for safety and comfort, and sanitary sales areas for each store. The market is a part of Olle Course No. 6. Directions: A 10-minute walk south from Jungang rotary in the center of Seogwipo City. Open: 3rd, 8th, 13th, 18th, 23rd, 28th of each month. Products available: Agricultural, fisheries, livestock products, food, and clothes. As the Jungmun Rural Five-Day Market is located at the center of the village, near Jungmun resort, many sightseers frequent the market for its eclectic atmosphere. The market is famous for its fresh fishery products supplied from the nearby fishing port. A great one-day trip of the area would include visiting the market as well as nearby Jungmun Beach, Cheonjeyeon Waterfall, and Jusangjeoli. Directions: A 5-minute bus ride from Jungmun resort. Open: 4th, 9th, 14th, 19th, 24th, 29th of each month. Products available: Agricultural, fisheries, livestock products, clothes, and general merchandise. The Seogwipo Rural Five-Day Market is close to many famous tourist attractions like Jeongbang Waterfall and Oedolgae. The market is the best place in Seogwipo City to hunt down traditional seasonal fares while also being able to witness its interesting livestock sales area. Directions: A 10-minute bus ride east from Jungang rotary, Seogwipo-City. Products available: Agricultural, fisheries, livestock products, and local specialty products. The Hallim Folk Five-Day Market is close to the Daerim intersection. The market is not that big, but you can see craftsman make traditional farm tools and bakers making Korean cookies. Hallim Park, Biyangdo, Geumneung Beach, and Hyeopjae Beach are all near the market. 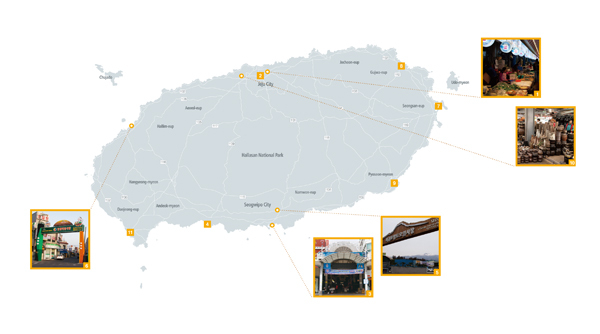 Directions: A 50-minute bus ride from the Jeju City Bus Terminal. Get off at Suwon-ri, Hallim-eup, Jeju City. Open: 1st, 6th, 11th, 16th, 21st, 26th of each month. Products available: Agricultural, fisheries, livestock products, local specialty products, clothes, and general merchandise. Located at the entrance of Seongsan Sunrise Peak, the Seongsan Five-Day Market hearkens back to the most traditional of markets. The sellers are farmers and retirees rather than merchants and so it has the warm and welcoming atmosphere of a country village. Directions: A 50-minute bus ride from the Jeju International Airport. Open: 5th, 10th, 15th, 20th, 25th, 30th of each month. Products available: Agricultural, fisheries, livestock products, local specialty products, clothes, imported goods, medicinal herbs, and farming tools. The Sehwa Folk Five-Day Market is the largest market on the eastern half of Jeju Island. This oceanfront market sells various types of merchandise at low prices. Gukbap (a boiled rice soup) is a must when visiting this five-day market. Directions: A 40-minute bus ride from the Jeju International Airport. Get off at the Sehwa Middle School bus stop. Products available: Agricultural, fisheries, and livestock products. The Pyoseon Five-Day Market is in the center of town. It is a rather small market, but is always full of warm, friendly people. Directions: A 40-minute bus ride from the Jeju International Airport. Get off at the Pyoseon Five-Day Market bus stop. Open: 2nd, 7th, 12th, 17th, 22nd, 27th of each month. Products available: Agricultural, fisheries, livestock products, linen and cottons, imported goods, livestock products, and medicinal herbs. The Jeju City Folk Five-Day Market has a 100-year-old history. It has shared the happiness and sadness of the island’s people. It is the most vibrant and the biggest five-day market in Korea. When it is open on a weekday it will attract some 10,000 shoppers and 20,000 people on the weekend. The Grandmother Market Zone within the market was designated specifically for vendors aged 65 and over. Directions: A 10-minute bus ride from the Jeju International Airport, and a 20-minute bus ride from the Jeju sea port. The Daejeong Five-Day Market is in Hamo-ri, Seogwipo City, adjacent to both Marado and Gapado islands and is a sea port. Fresh fish displayed on stands will tickle your palate. There are fish restaurants around the market to satisfy your hunger. Directions: A 45-minute bus ride from the Jeju International Airport. Get off at the Daejeong Five-Day Market bus stop.